We all know that wherever you can find people you're likely to find animals. But in jail? It's true. Right here in New York, several correctional facilities are home to a number of cats and dogs for some pretty surprising reasons. Their unlikely presence at these facilities has sparked some long-lasting friendships between people whose lives may have otherwise never crossed paths, proving once again that animals can build a bridge anywhere they are. Last July, an inmate of this sprawling, 400-acre, multi-complex correctional facility just off the coast of Long Island City in Queens found more than he was bargaining for one fateful day last year. "The staff who work on Rikers Island knew there were cats on the island, but they didn't know how many there actually were," said Bryan Kortis, executive director of New York-based Neighborhood Cats, an education and advocacy group for feral cat colonies. "But then an inmate who was trying to escape dove under a trailer, and teargas was used to flush him out. A whole bunch of cats came running out instead. So that's when we got introduced to the situation." It was then that an otherwise unusual partnership between the NYC Department of Corrections, Neighborhood Cats and several other animal welfare groups began. A full-out effort was launched in March of 2002 to spay and neuter these jailhouse cats and plan for their long-term care. The American Society for the Prevention of Cruelty to Animals, The Center for Animal Care and Control and The Humane Society of New York joined Neighborhood Cats last year on August 26 for a final "Spay Day" on Rikers Island. (During the trapping phase of the project, Francis' Friends, Inc. and Kitty Caretakers of Queens, Inc. also provided assistance. )The project is believed to be the largest Trap-Neuter-Return (TNR) project ever implemented at a single facility in the United States. "We trapped about 260 cats altogether," Mr. Kortis says. "Between 45 to 50 of these were young cats and kittens that were not feral, so we were able to adopt them out. We returned just over 200 to the colony." A few cats that were found in advanced stages of terminal illness were humanely euthanized. So far, the Rikers Island T-N-R- part appears to be working, especially the neutering part. "When we arrived last March there were kittens all over the place," Mr. Kortis says, "but this March I haven't seen any." Correctional department employees take care of the day-to-day feeding and maintenance of the cat colony under the guidance of Captain Gloria Murli, who received humanitarian awards for her work. Because the inmate population on Rikers Island is transient the decision was made not to invite their participation. Even so, it's not unusual to find that some inmates are sharing scraps from their meals with the cats outside of their windows. How did all of these cats end up on Riker's Island in the first place? It's impossible to know for sure, but it's suspected that at least one pair of cats were transported and abandoned on the island about 20 years ago, and the rest is history. Theoretically, a single pair of fertile cats can grow to a population as high as 1,280 cats within two years, making the TNR approach a humane option for feral cat management. Feral cats congregate in areas where they can find food and shelter "and once they take hold, it's almost impossible to make them go away," Mr. Kortis says. And while Rikers Island is a relatively isolated area, feral cat colonies tend to spring up in or near residential neighborhood and are not universally welcomed neighbors. 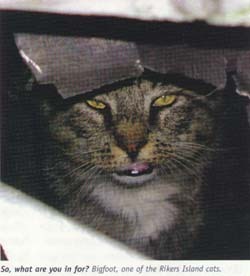 An important part of Neighborhood Cats' and other feral cat help groups is education and outreach. "By the time we enter the situation its because people have started to complain," Mr. Kortis said. "We don't think the people complaining are bad people; we understand their hostility if they're getting woken up in the middle of the night by a dozen noisy cats." Humane sterilization, release and management of a stabilized colony often alleviates the situation and sometimes brings fringe benefits. "Building superintendents are our best friends," Mr. Kortis says, because rats and mice smell the cats and stay far away. Funding and supplies for the Rikers Island TNR Project was provided by the animal welfare groups mentioned as well as Nutro Products (MAX and Natural Choice Premium pet foods), PetsMart Charities, Inc., The Artimus Project, United Animal Nation and the Tri-County Pony Club. Support and sponsorships are needed for the colony's long-term care and can be sent to: The Rikers Island Feral Cat Fund, C/O Neighborhood Cats, Inc., 2565 Broadway, No. 555, New York, NY 10025. 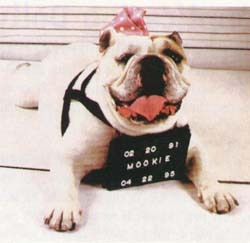 Normally, if you see a dog in jail, it's usually there on police business. But at several correctional facilities in the tri-state area, you're just as likely to see a happy Labrador pup being trained for the important and noble task of helping the visually impaired live a full and active life. Only this time, it's the inmates that are preparing the dogs for life on the outside. 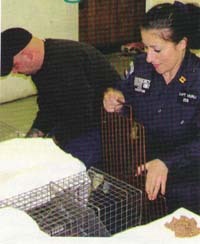 This unique program, Puppies Behind Bars, was officially started by president Gloria Gilbert Stoga in 1997, but Ms. Stoga says the seeds of the program were planted year before. "A vet down in Florida came up with the idea in 1990, and I thought it was a brilliant idea," admits Ms. Stoga, a former member of Mayor Rudolph Guiliani's Youth Empowerment Services Commission. She was also spurred on by experience: her and her husband were adoptive parents to Arrow, an almost-seeing-eye-dog who was honorably discharged to their home as a companion animal for medical reasons. Some tough customers had to be convinced that this program would work. Ms. Stoga says guide dog schools were very skeptical at first, concerned that the dogs wouldn't be properly socialized-or even hurt-inside prison walls. "Now, they're not skeptical at all," Ms. Stoga says. Inmates interested in the program are very carefully screened by both PBB and the prison. Mental health, the nature of their crime and the years left on their sentence are all factored in. With training and constant guidance from the PBB staff, inmates are responsible for training the dogs for eighteen months, with the dogs living, eating, and sleeping with the inmates. Dogs who successfully complete that part of the program are then sent off to three months of final training before placement with a visually impaired owner. The effect on virtually everyone involved or exposed to the program is infectious. Dogs-in-training have been known to help domestic violence victims open up in therapy and calm jittery inmates before the parole board. And the effect on the inmates themselves is immeasurable. "We see tremendous growth," Ms. Stoga says. "Their sense of self worth and self-esteem goes up. They're given responsibility by being entrusted with a life to take care of and they respond accordingly." Their experience also appears to carry them through life on the outside. "None of the inmates that have been released from prison and have stood in touch with us have been re-incarcerated," Ms. Stoga says. When PBB began six years ago there were five dogs and ten inmates participating. Today, there are more than 40 dogs in training and ten times the number of participating inmates spread throughout the Bedford Hills, Fishkill, Mid-Orange and Edna Mahan Correctional Facilities in New York and New Jersey, as well as the Federal Correctional Institute in Danbury, Connecticut. Approximately 95 percent of the prison population in upstate New York's correctional facilities were originally residents of New York City. The program receives no governmental grants and is 100 percent privately funded. To help, send donations to Puppies Behind Bars, 99 Madison Avenue, 2nd Floor, New York, NY 10016. The program also needs "weekend puppysitters" -- private citizens who can take a prison-raised guide dog into their home for a few weekends each month for 13 months. This helps give the dogs a well-rounded education with experiences on the outside-from taking the subway to waiting for a latte at Starbucks. Call (212) 924-7404 or email gstoga@puppiesbehindbars.com for more information.